Caution: Information on these pages is purely for educational purposes and is not intended to be used as treatment. My chard plants on the allotment have been interspersed with beautiful feverfew flowers this year. As a remedy for preventing migraine headaches and arthritic pains, the leaves are best used fresh and a couple taken daily with a bit of bread and butter, as they can be irritating on the tongue. It’s use is likely to be related to its antiinflammatory properties and relaxing effects on blood vessels, which may regulate blood flow to the brain and liver. 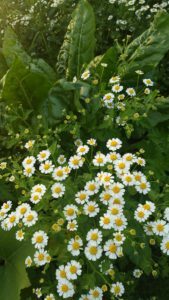 Recent research below supports the use of feverfew as an antiinflammatory and anti-migraine treatment, however, as with most plants the identified ‘active’ constituent parthenolide is likely to be only partly responsible for the therapeutic benefit. A study has shown that even when the parthenolide is removed, the remaining extract retains significant antiinflammatory properties (Sur et al., 2009), reinforcing the herbalists’ belief in the benefits of the whole plant compared to isolated constituents. Guilbot A, Bangratz M, Ait Abdellah S, Lucas C. A combination of coenzyme Q10, feverfew and magnesium for migraine prophylaxis: a prospective observational study. BMC Complement Altern Med. 2017 Aug 30;17(1):433. Ferro EC, Biagini AP, da Silva ÍE, Silva ML, Silva JR.The combined effect of acupuncture and Tanacetum parthenium on quality of life in women with headache: randomised study. Acupunct Med. 2012 Dec;30(4):252-7. Bitter herbs are one of the most important groups of herbal medicines. 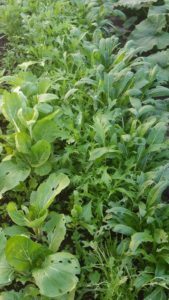 The picture on the left is a bed of greens on my allotment which has an assortment of leaves for use in salads and stir-fries, including chicory, dandelion, kale, rocket and mizuna. The bitter taste of these plants actually has a fundamentally important effect on the digestive system. Bitter taste receptors in the mouth, and further down the digestive tract, lead to stimulation of the whole digestive process, from secretion of stomach acid, enzymes and bile, to motility of the digestive tract and a healthy blood supply to the digestive organs. A lack of bitter foods in the modern western diet may contribute to poor digestion that so many suffer from. A bitter green salad before each meal however, is inconvenient; an alternative is a dIgestive bitter aperitif such as Angostura bitters, which are little used these days, but are an easy and pleasant way of supporting good digestion; they should be taken about 15-20 minutes before food as directed on the bottle. The bitter herb here is gentian, which is considered a strong bitter, but there are many bitter herbs that can be used instead – centaury is a gentle bitter that can be used for sensitive stomachs, artichoke leaf also protects and repairs the liver, angelica root is also warming and barberry root is antiseptic. 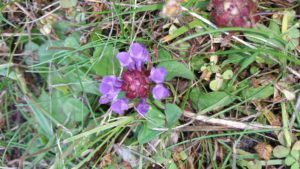 This tiny plant is popping up all over the place at the moment, in lawns and grass verges. Although little used in modern herbalism, it has been the surprising subject of research studies for its antiviral and anticancer properties. However, its traditional uses are probably more reliable – it’s a great wound healer (when applied to any tissue damage, such as burns, cuts and ulcers); when taken orally as a tea it helps strengthen immune function in colds, sore throats and allergies, as well as helping resolve swollen glands via the lymphatic system. As a mildly bitter herb it also helps liver function and digestion.